St. Brigid’s Day falls on the first of February, and is traditionally understood as marking the beginning of spring in Irish custom. Dedicated to the saint nicknamed Muire na nGael or the ‘Mary of the Irish’ (a designation given to her on account of the adoration and high regard in which she has long been held by the people of this island), St. Brigid's Day is a period full with emblems of regeneration, renewal and propagation. 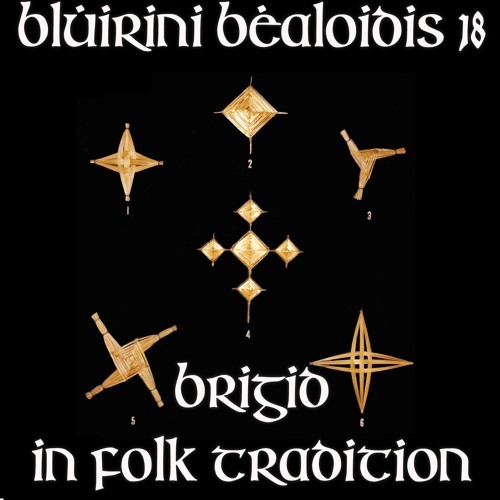 For the first in the 2019 series of Blúiríní Béaloidis, hosts Claire Doohan and Jonny Dillon explore the feast of St. Brigid by examining her pre-Christian roots; tracing her spread across Europe and exploring links with early Vedic literature and the Indo-European tradition before considering the role and function of Ireland's patroness, along with contemporary attitudes held towards her in folk custom. So, sit a while with us as we welcome in the dawn of a new season. Brigid, spring, you are welcome. Come in! Dog-ears! Jonny, you bloody savage! Get it together will you. Have either of ye seen the Atlantean Quartet? It's a series of 4 documentaries about Atlantic trade routes and how it links cultures and how the various peoples along these routes share many similarities in their folklore traditions. Like for instance if you listen to traditional Turkish singing, if you closed your eyes you could easily think you were in Connemara listening to a sean nós performance. Very interesting indeed. St Brigid's Greystones was my first school. Run by nuns. I attended for Junior and Senior infants and first class, after that it was all girls and I went off to St Kevin's, which was all boys, for the remainder of primary school. I remember the "big girls" who I guess were prefects, they used to look after us ickle babbies while our teachers were otherwise occupied. I was terrified of them. They were probably no older than 12, but to my wee self they were tyrannical giants, utterly intimidating. Another brilliant podcast. Thank you so much for the hours and hours of research you go through to bring these traditions and stories out of the archives. The revival of these stories will have a deep impact on those looking to reconnect with our heritage, whether home or away. Your work is greatly appreciated.